It’s been almost a full year since I’ve finished drafting my A4 pages for my first comic book project and after long headache inducing evenings only accompanied by small shots of coffee and shouting profanities at my laptop I have at last completed the digital inking process. I am quite pleased, and dare I say impressed, with myself for actually managing to endure for this long. So much in fact that despite the original plan to only have it made in black and white, I’ve decided to go all the way and do coloring as well. I mean, I’ve already spent so much time on this project I’d rather finish it properly. What’s another 6 month? So as of tomorrow I’ll begin doing color proofs of my characters and then start coloring the pages. 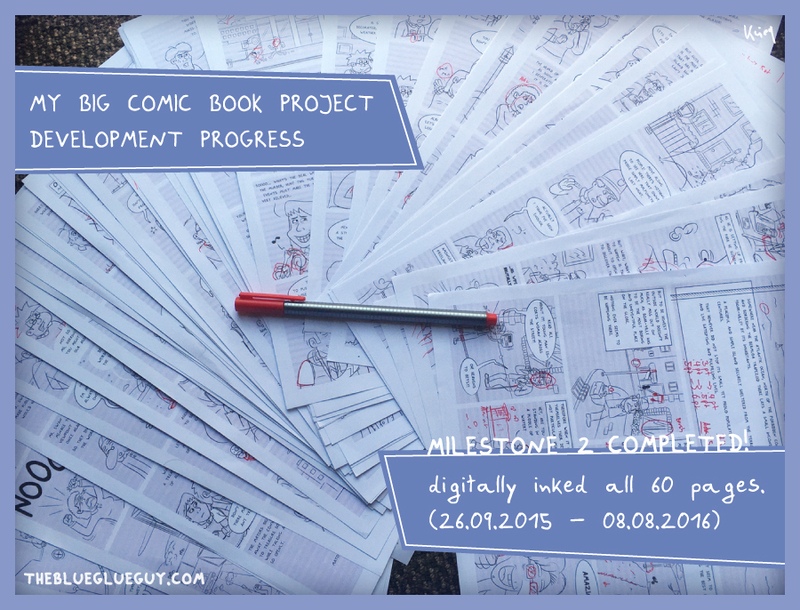 Despite this project being more of a personal challenge I do plan to release the comic on my website eventually. I haven’t yet decided how and in what form (perhaps I’ll even let it professionally printed just to show of), but first I’ll concentrate on finishing the comic before bothering with minor details like that. I am very eager to see if you people will actually like it.